The Seven Deadly Sins tells the story of Elizabeth the princess of Britannia. Britannia is a country in ruins due to the king being assassinated and things falling into chaos due to the Holy Knights starting a war. Elizabeth has set out on a quest to find the Seven Deadly Sins who were, apparently, all sent into exile due to committing awful crimes. The Seven Deadly Sins are our young princess’ only hope however, and thus our story begins. 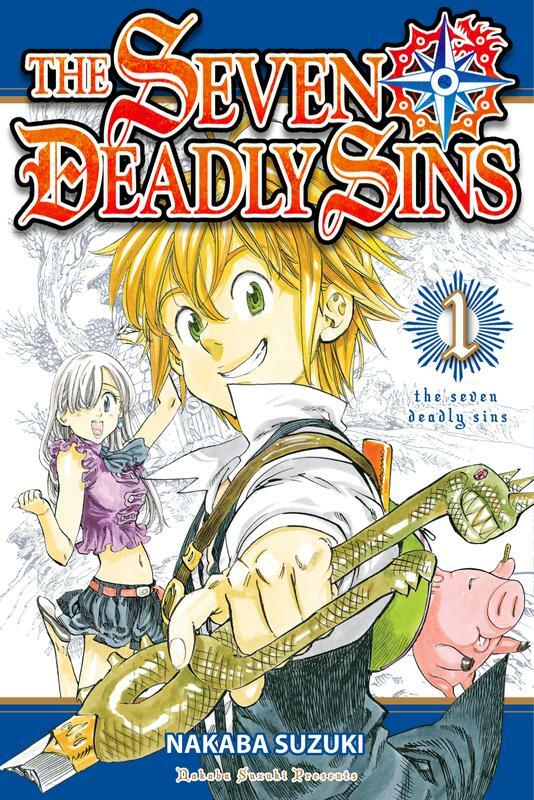 The first volume of the series contains the first five chapters of The Seven Deadly Sins. In these five chapters Elizabeth finds herself encountering Meliodas, the leader of the Seven Deadly Sins, and his partner Hawk. Hawk is a cute mascot character in the form of a talking pig, the relationship between him and Meliodas seems to be a lot alike the one between Natsu and Happy in Fairy Tail, although perhaps not as friendly. After their encounter in Meliodas’ travelling bar, Elizabeth and him set out on a quest to round up the rest of the Seven Deadly Sins so that they may take back the kingdom from the Holy Knights. At this stage it’s a rather simple story befitting a Shonen story, but it seems to be a diamond in the rough. While the story is simple and Meliodas is no doubt an overpowered character who can defeat any enemy who dares come his way, so far anyway, there are hints of something more interesting underneath it all. So far a few hints of a mystery have been thrown our way. In five chapters we’ve discovered that the Seven Deadly Sins have been framed for crimes they never committed, and Meliodas has no memory of what happened in the time they got framed and outcasted. The overall story is presented in such a way that despite the fact Elizabeth and Meliodas are quite generic you want to find out more about them and the story they’ve got behind them. The Holy Knights sadly don’t fare much better than our heroes do, they’re very much generic bad guys and until we learn more about why they’ve done what they did in starting the war I’m left with little reason to actually care about them. Hawk is an interesting character but only really exists to tell Meliodas off when he’s becoming a bit too perverted with Elizabeth and doesn’t have a great deal to him beyond that. Sadly, Hawk just doesn’t work as the Happy of the series. The Seven Deadly Sins isn’t quite as kid friendly as other shounen series either, with fanservice being a very prominent part of the story overall. Hopefully in later volumes this is fazed out a bit in favour of better character development, but right now I won’t hold my breath and wouldn’t recommend the series to younger readers because of it. However, with that said I actually really like the world of Britannia. It’s brought to life with detailed and colourful drawings for the backgrounds and surroundings that the characters are in, leaving us with a very pretty fantasy setting that at least looks the part. The manga in general is extremely well drawn, from the backgrounds to the overall character designs. The Seven Deadly Sins definitely deserves credit for its artwork if nothing else. I’m looking forward to seeing how the world and overall setting expands in future volumes as right now it has a fair bit of potential. Overall the series is setting up for some interesting developments in the story, but the characters so far really don’t stand out and until I’ve read future volumes I’m not keen on recommending it, at least not unless you were in it just for the pretty artwork. I came into the series with a curiosity which still holds strong, but sadly The Seven Deadly Sins isn’t quite the big hit I was hoping it was going to be. The Seven Deadly Sins can be read on Crunchyroll right here where it’s updated weekly, or you can buy the series in print thanks to Kodansha Comics.